In December 2015, President Barack Obama signed the Every Student Succeeds Act, or ESSA, which replaced No Child Left Behind, or NCLB, as the nation’s major law governing public schools. ESSA retains the requirement that states test all students in reading and math in grades three through eight and once in high school, as well as the requirement that states ensure those tests align with states’ college- and career-ready standards. However, the law makes significant changes to the role of tests in state education systems. For example, ESSA requires states to include a broader set of factors in school accountability systems rather than just test scores; provides funding for states and districts to audit and streamline their testing regimes; and allows states to cap the amount of instructional time devoted to testing. It also eliminates the requirement under the Obama administration’s NCLB waiver program that states evaluate teacher performance based on, in part, student test score growth. Taken together, these provisions greatly reduce the stakes of state tests for schools and teachers. They also give states substantially more autonomy over how they define school success and the interventions they employ when schools fail to demonstrate progress. The likely result? A significant reduction in the level of angst regarding testing among teachers and parents. Absent other reforms, however, the legislation will not necessarily lead to better outcomes for students. States and districts must work together to seize this opportunity to design coherent, aligned assessment systems that are based on rigorous standards. These systems need to include the smart and strategic use of formative and interim tests that provide real-time feedback to inform instruction, as well as high-quality summative tests that measure critical thinking skills and student mastery of standards. Failure to take such an approach may result in states inadvertently exacerbating frustration with tests by keeping the same testing regime in place but not making the tests more useful for students and teachers. There is a better path. Today, states have an opportunity to use the new flexibility embedded in ESSA to develop stronger testing systems without the pressure of NCLB’s exclusive focus on summative tests. They also have the opportunity to innovate: Through a new pilot program that will allow seven states to develop radically new approaches to assessments, states can experiment with performance-based and instructionally embedded tests and use technology to advance testing. Indeed, these pilot states will have the freedom to imagine a testing system of the future in which standardized tests taken on one day each year are no longer the typical way of assessing student learning. 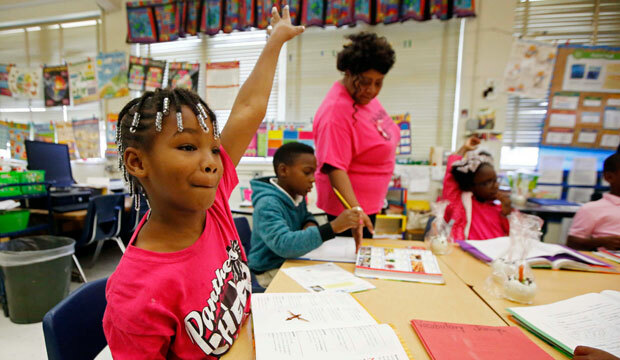 Over a six-month span, researchers at the Center for American Progress interviewed dozens of parents, teachers, school leaders, system leaders, advocates, assessment experts, and policy leaders in an attempt to identify what can be done to ensure that tests are being used in service of teaching and learning. Although they are few and far between, models of coherent, aligned teaching and learning systems do exist. In these systems, the curriculum and end of year summative assessments are aligned with high academic standards. Interim tests, administered at key points throughout the year, provide a check on whether students are on track to meet the grade level standards. Short, high-quality formative tests give real-time feedback to teachers and parents so that they can use the results to inform instruction and to course correct when needed. School and system leaders use data to determine if all students receive the high-quality education they deserve and to provide more support or intervention if the results show that individual students, entire classrooms, or schools are off track. Unfortunately, these models are the exception—not the rule. Instead, testing today often occurs in a vacuum. Disconnected from the curriculum, standardized tests halt or disrupt actual schooling for weeks on end, and they create significant anxiety for both students and teachers who report heartbreaking stories of children crying in class or vomiting in the bathroom. The test results, which take months to arrive, rarely result in positive changes or benefits for students that either parents or teachers can observe. Communication about tests is insufficient. To the extent that it occurs, public communication has focused on logistical details such as when the tests will occur and not on more important questions such as why tests were administered and how the results will be used. State summative assessments are often not aligned with the district’s curriculum. Tests that are not aligned with the curriculum lead to confusion among teachers about what topics to focus on when teaching and drive test preparation practices. Too much test prep is occurring. Around 60 percent of parents reported that their child participated in some sort of test prep at least once during CAP’s month-long diary study, and some 15 percent of parents reported that their child participated in test prep more than three times during the study period. Weak logistics and the limits of technology often lengthen testing windows and create major disconnects between taking a test and seeing the results. By disrupting the schedule of all students in a school, long testing windows have created the impression that tests take up much more of students’ time than they do in reality. In a way, these findings are all examples of testing for testing’s sake. Looking forward, the goal must be an effective assessment system that aligns with rigorous standards and helps determine whether students are meeting grade-level expectations and making progress. In other words, the goal is to have tests that support and encourage effective teaching and learning. Because the problems with testing are structural and systemic, they do not lend themselves to an easy fix. Nevertheless, ESSA provides an opportunity for a fresh start, and system leaders can capitalize on the flexibility in the new law to make changes in the short and long run to develop a system of better, fairer, and fewer tests. What’s important to keep in mind is that in the new education policy world of ESSA, testing systems continue to need to be refined—not discarded. Parents and teachers want annual standardized testing to continue. Despite media reports to the contrary, there remains significant support for tests. But parents also want tests to be useful and to provide value for their children. Develop assessment principles. Leaders and advocates should develop or adopt a set of principles—informed by assessment experts; research on assessment quality and the purpose of assessment; and feedback from parents, teachers and students—that define a high-quality testing system for their state. These principles should articulate a vision for a testing system at both the state and local levels that is simple, intentional, and supports strong and thoughtful school accountability systems. Leaders should ground all conversations about testing in these principles, using them as a guidepost to constantly remind the general public and key stakeholders of why tests are valuable, as well as of the purpose they serve. Conduct alignment studies. System leaders should take a holistic look at their systems in order to ensure that students are tested on what they are learning and that what students are learning aligns with state standards. These alignment studies should be executed up and down the school system so that the states know that teachers are teaching to the standards and that the tests are actually measuring what composes the standards. They should go beyond the typical studies that look at alignment between assessments and standards by looking at instructional alignment and student learning. Provide support for districts in choosing high-quality formative and interim tests. Not every district has the capacity to evaluate all of the formative and interim tests that are available. States should show leadership in this area by reviewing these tests and making available information about their quality and alignment with state standards or by providing their districts with professional development in conducting their own reviews and making informed decisions. Demand that test results are delivered in a timely fashion. The results of large-scale assessments, such as the SAT, are often delivered within weeks. While that aggressive timeline might not be realistic for new assessments, states should push testing companies for a much faster turnaround time in the delivery of test results. And while faster results might require higher costs and greater use of automated scoring for open response test items, CAP believes that a policy of two months or less needs to be the norm, not the outlier, when it comes to state testing programs. Increase the value of tests for schools, parents, and students. States should partner with institutions of higher education to use the state required high school exam as a college placement exam. States could also consider replacing the required high school proficiency test with a college entrance exam. Some states are using the ACT or the SAT as the required high school summative test, and ESSA now permits individual districts to use nationally recognized high school assessments in place of the state’s assessment if they are aligned to the state’s standards and can provide comparable data. Since most college-bound students have to take one of these tests, substituting them for the high school proficiency test will reduce the amount of testing and provide greater value to students. However, states still have the responsibility to make sure that these tests are aligned with their state high school standards. In addition, states should reward students that perform well on the tests with scholarships or other awards or recognition—similar to the National Merit Scholarship Program, for example—which could help students find value in the tests. Schools should also provide parents with the data from all assessments—including formative, interim, and summative assessments—along with individualized resources to help their children improve. Finally, states can help schools see value in the exams by celebrating schools that achieve high performance or significant progress on the tests with rewards similar to the federal Blue Ribbon Schools Program or public recognition ceremonies with the governor or state legislators. Take advantage of the new ESSA assessment pilot program to design and implement truly innovative assessment regimes. ESSA maintains the federal requirement for annual statewide assessments in reading and math in grades three through eight and once in high school. But the law also includes a pilot program that initially allows up to seven states to develop innovative assessment systems—such as competency-based assessments and instructionally embedded assessments—that provide valid, reliable, and comparable data on student achievement. States approved for this program can pilot these innovative assessment systems in a few districts before implementing them statewide. States should take advantage of this flexibility in order to design and implement truly out-of-the-box assessment systems that move beyond a single summative test. Develop better communication tools. State communication regarding testing is in disarray. For example, in many states, score reports for state assessments are a muddle of confusing data. CAP recommends that states develop clearer score reports that are accompanied by an explanation of how to interpret the results, as well as the promotion of a website that provides a broad spectrum of sample test items that cover the range of potential testing topics and other FAQs about state testing programs. States should also train district and school leaders in how to communicate about test results to parents. Identify overlapping testing programs. Districts should identify tests that are unnecessary and eliminate them. ESSA includes new funding to support state and district efforts to audit their assessments and eliminate redundant and unnecessary tests. Another process that may work to limit testing is to have district leaders sort the tests by their purpose. If there are redundancies, leaders should consult educators and work to eliminate the redundant tests. Furthermore, standardized tests in kindergarten through second grade should be eliminated. This would reduce some of the overtesting and avoid subjecting young children to high-stakes and stressful exams. That said, districts should continue to screen young elementary children to make sure they are on track. Build local capacity to support teachers’ understanding of assessment design and administration. Teachers need more support around assessments—particularly the new assessments—and districts should provide more professional development regarding both the use and content of the new tests, as well as better ways for teachers to use testing data in the classroom. It is important that teachers are included in building this professional development in order to ensure it meets their specific needs. Districts should help school leaders understand how best to communicate with parents and teachers, as well as help students prepare for the tests. Create coherent systems of high-quality formative and interim assessments that are aligned with state standards. In many areas today, formative and interim tests are weak and lacking in alignment and cognitive rigor. District leaders should revamp these assessments so that they are more robust and better aligned with the state’s academic content standards, curriculum, and state summative tests. Better communicate with parents about tests. Communication about testing should consist of more than robocalls urging parents to give their children a good breakfast. To build trust, districts should be far more transparent and proactive around assessments. This includes posting testing calendars online, creating easily understandable overviews of the district’s assessment system—including the purpose, use, and time for each assessment—releasing sample test items, and doing more to communicate important information about the assessments. Tackle logistics. If a school only has one computer lab, it will take a long time to cycle every student through an online test. These sorts of long testing windows lead to disrupted schedules for every student in the school. Well in advance of testing, district leaders should create detailed plans for how they will test all students with the least disruption to learning. They should also develop creative solutions such as mobile testing centers or partnerships with local businesses or community organizations. Finally, districts should work with schools to ensure that all technology necessary for assessments functions properly prior to testing. Make the actual test-taking process as convenient and pleasant as possible for children. For example, schools should allow students who complete the test early to go to the playground or to another area where they can relax; permit children to go to the bathroom as needed during testing; provide multiple opportunities to make up the test if students are out of school on testing day; and allow breaks between test sections. In order to create a positive and low-stress culture around test taking, schools should provide written, online, or in-person guidance and training for teachers administering the tests. Rather than schools across the state developing their own respective guidance, state leaders could create guidance for districts and school leaders regarding test taking practices that could be disseminated statewide. Finally, to the fullest extent possible, schools should ensure that their testing coordinators do not also serve in student support roles, such as school counselors, since these dual roles can create conflicts and additional stress for students who may experience test anxiety. Hold communications events such as annual explain-the-test nights. When it comes to state tests, parents receive very little high-quality information. One promising initiative is the explain-the-test nights offered by schools to answer parents’ questions about exams. Work with teachers to communicate to parents. When parents have questions, they usually turn to teachers, and schools should make sure that educators have reliable information on state and local tests, including why the assessments are given and the role the tests play in their schools and classrooms. Stop unnecessary test prep. Students need to be familiar with an exam and the types of questions it asks. There is also a place for making sure that students are familiar with the technology that they will use for the exam. But unnecessary test prep, such as spending weeks administering practice test items, must end. In addition, pep rallies and other practices that intensify the pressure on students should be eliminated. Provide strong technical assistance to states wanting to submit applications for the innovative assessment pilot program. The new testing pilot allows states to develop next-generation testing systems, but many states do not have the capacity to design and implement these innovative ideas. The U.S. Department of Education should provide technical assistance to states wanting to explore what this pilot program could mean for them and should provide support to states during the development and application process. Spread best practice and research next-generation assessments. The U.S. Department of Education must do more to disseminate thoughtful assessment practices to states, particularly about ensuring that the tests provide real value to parents and students and communicating with school districts and parents. This set of activities could include providing model score reports that clearly explain the purpose and value of the test. Better information will be critical for educators at the local level as they roll out robust programs. State and district testing systems will not be fixed in a single year. Over the next three to five years, education leaders and policymakers should develop a robust, coherent, and aligned system of standards and assessments that measures student progress toward challenging state standards. In this system, formative and interim assessments work together to provide teachers, parents, and students with actionable information throughout the year about what students know and can do and whether students are on track. Summative assessments, on the other hand, should act as a final check of teaching and learning. Improving the quality and alignment of formative and interim assessments is particularly important. These are the tests that are most useful to teachers and provide them with the most up-to-date information regarding their students. However, if those tests are low quality and are not aligned with state academic standards, then the information is rarely useful for either teachers or students. But in a healthy assessment system, formative and interim tests are closely aligned with what is taught in the classroom on a daily basis and the results of these tests provide information that informs teaching and learning. Formative and interim assessments should only be used if they are both high quality and add value. Therefore, any local assessment that is unaligned, out of date, or duplicative should be eliminated. As a result, the amount of time students spend testing will decrease significantly, and teachers will still have important information about student progress to help guide their instruction. In this new vision for testing, an effective assessment system will routinely evaluate student knowledge and skills through formative and interim assessments that provide timely and actionable feedback to teachers and parents, culminating in a summative test that helps to determine whether students are meeting grade-level standards and making progress. For this assessment system to be as useful as possible, alignment is key. All assessments—formative, interim, and summative—must align with academic standards. In other words, what is tested should match what students are expected to know at each grade level. Furthermore, formative assessments and interim assessments should lead into the summative assessments. Simply put, how well students perform on a summative test should not be a surprise. In short, testing is a vital piece of a student’s education. However, far too often, U.S. testing policies, the tests themselves, and the support provided to teachers proves to be inadequate. It does not have to be this way. Through the recommendations detailed in the paper, national, state, and local education leaders can take significant steps toward improving their assessment systems and ensuring that students, teachers, and parents receive the information they need in order to help all students receive a high-quality education. Catherine Brown is the Vice President of Education Policy at the Center for American Progress. Ulrich Boser is a Senior Fellow at the Center. Scott Sargrad is the Director for Standards and Accountability on the Education Policy team at the Center. Max Marchitello is a Policy Analyst for the Pre-K-12 Education Policy team at the Center.